Michenerite: Mineral information, data and localities. In recognition of Charles Edward Michener (Red Deer, Alberta January 1907- Toronto 15 October 2004), Canadian exploration geologist, International Nickel Co., who is credited with the discovery of a number of major ore deposits, including the Thompson nickel belt in Manitoba and a laterite deposit in Indonesia. Michener discovered and first studied the mineral that was later named after him (Horváth 2003). Chemically similar to unnamed species: 'UM1961-11-Te:BiPd', 'UM1970-27-Te:BiPd', 'UM1976-31-Te:BiPdSb'. See also Unnamed (Rh-Analogue of Michenerite). Pentlandite 1 photo of Michenerite associated with Pentlandite on mindat.org. Pyrrhotite 1 photo of Michenerite associated with Pyrrhotite on mindat.org. Merenskyite 1 photo of Michenerite associated with Merenskyite on mindat.org. Hawley, J.E. and Berry, L.G. (1958) Michenerite and froodite, palladium bismuth minerals. Canadian Mineralogist: 6: 200-209. [TL1] [Abstract in American Mineralogist (1959) 44: 207]. American Mineralogist (1963): 48: 1184. Cabri, L.J., Harris, D.C., and Gait, R.I. (1973) Michenerite (PdBiTe) redefined and froodite (PdBi2) confirmed from the Sudbury area. Canadian Mineralogist: 11: 903-912. Childs, J.D. and Hall, S.R. (1973) The crystal structure of michenerite, PdBiTe. Canadian Mineralogist: 12: 61-65. Hudson, D.R. (1986) Platinum-group minerals from the Kambalda nickel deposits, Western Australia, Economic Geology, Vol 81, Vol.5 pp 1218-1225. Hudson, D.R. (1986) Platinum-group minerals from the Kambalda nickel deposits, Western Australia, Economic Geology, Vol 81, No.5 pp.1218-1225. Hudson, D.R., Robinson, B.W., Vigers, R.B.W. (1978) Zoned michenerite-testibiopalladite from Kambalda, Western Australia, The Canadian Mineralogist, Vol. 16 May 1978, pp.121-126. Mineral. Deposita 42 (2007) 551-581. HOATSON,DM, WALLACE,DA, SUN,S-S, MACIAS,LF, SIMPSON,CJ and KEAYS,RR (1992) Petrology and platinum-group-element geochemistry of Archaean layered mafic-ultramafic intrusions, west Pilbara block, Western Australia. AGSO Bull. 242, 319pp. plus map. Maier, W.D., Barnes, S.-J., Chinyepi, G., Barton, Jr., J.M., Eglington, B., and Setshedi, I. (2008): Mineralium Deposita 43, 37-60. Knight, R. (2014). The primary magmatic concentration and secondary remobilisation of platinum-group elements in Ni-Cu sulphide ores (Doctoral dissertation, Cardiff University). Singer, D.A., Berger, V.I., and Moring, B.C. (2008): US Geological Survey Open-File Report 2008-1155.; Georgiev, Georgi (2008) A genetic model of the Elatsite porphyry copper deposit, Bulgaria. GEOCHEMISTRY, MINERALOGY AND PETROLOGY • SOFIA 46, 143-160. Campos-Alvarez, N. O., Samson, I. M., & Fryer, B. J. (2012). The roles of magmatic and hydrothermal processes in PGE mineralization, Ferguson Lake deposit, Nunavut, Canada. Mineralium Deposita, 47(4), 441-465. Péntek, A., Molnár, F., Tuba, G., Watkinson, D. H., & Jones, P. C. (2013). The significance of partial melting processes in hydrothermal low sulfide Cu-Ni-PGE mineralization within the footwall of the Sudbury Igneous Complex, Ontario, Canada. Economic Geology, 108(1), 59-78. Sarah A. S. Dare, Sarah-Jane Barnes and Hazel M. Prichard (2010): The distribution of platinum group elements (PGE) and other chalcophile elements among sulfides from the Creighton Ni–Cu–PGE sulfide deposit, Sudbury, Canada, and the origin of palladium in pentlandite. Mineralium Deposita 45, 765-793.; Dare, S. A., Barnes, S. J., Prichard, H. M., & Fisher, P. C. (2010). The timing and formation of platinum-group minerals from the Creighton Ni-Cu-platinum-group element sulfide deposit, Sudbury, Canada: early crystallization of PGE-rich sulfarsenides. Economic Geology, 105(6), 1071-1096. Ames, D.E., Kjarsgaard, I.M., and Douma, S.L., 2003, Sudbury Ni-Cu-PGE Ore Mineralogy Compilation: Sudbury Targeted Geoscience Initiative (TGI): Geological Survey of Canada, Open File 1787; Chen, Yuan, "Precious-metal Mineralization And Sulfide-silicate Relationships In Some Canadian Nickel-copper Sulfide Deposits: Thompson Mine, Manitoba; Sudbury, Ontario; Dundonald Beach, Ontario" (1993). Digitized Theses. Paper 2231. HAWLEY, J.E. & BERRY, L.G. (1958): Michenerite and froodite, palladium bismuth minerals. Canadian Mineralogist 6, 200-209. [TL1] CABRI, L.J., HARRIS, D.C. & GAIT, R.I. (1973): Michenerite (PdBiTe) redefined and froodite (PdBi2) confirmed from the Sudbury area. Canadian Mineralogist 11, 903-912. CHILDS, J.D. & HALL, S.R. (1973): The crystal structure of michenerite, PdBiTe. Canadian Mineralogist 12, 61-65. LeFort, D.T. (2012) A mineralogical and fluid inclusion study of modified, contact style Ni-Cu-PGE ores in the #1 and #4 shear zones, Garson Mine, Sudbury, Ontario, Canada. Unpublished M.Sc thesis, Saint Mary's University, Halifax, Nova Scotia. 189p. Ford, F.D., Wecholaz, C.R. & Lee, A. (2011) Predicting process outcomes for Sudbury platinum-group minerals using grade-recovery modeling from mineral liberation analyzer (MLA) data. Canadian Mineralogist 49, 1627-1642. 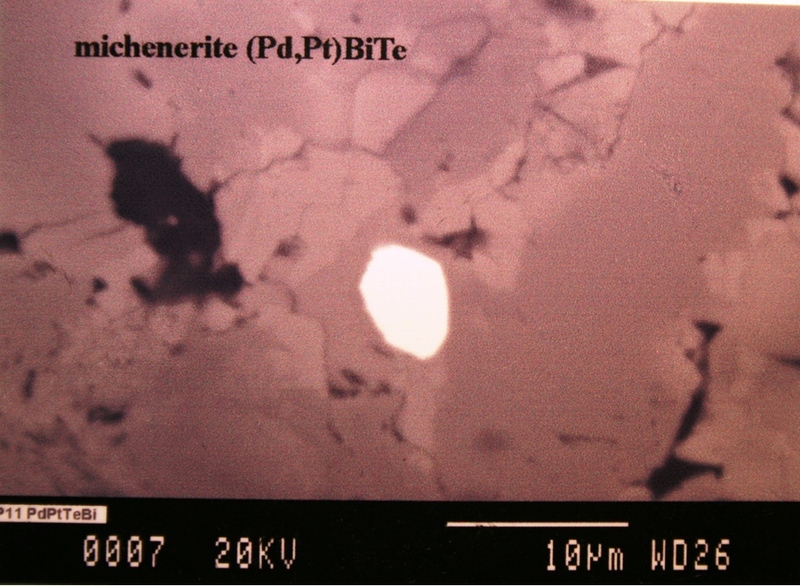 Sarah A. S. Dare, Sarah-Jane Barnes, Hazel M. Prichard und Peter C. Fisher (2011): Chalcophile and platinum-group element (PGE) concentrations in the sulfide minerals from the McCreedy East deposit, Sudbury, Canada, and the origin of PGE in pyrite. Mineralium Deposita 46, 381-407.; Ames, D.E., Kjarsgaard, I.M., and Douma, S.L., (2003), Sudbury Ni-Cu-PGE Ore Mineralogy Compilation: Sudbury Targeted Geoscience Initiative (TGI): Geological Survey of Canada, Open File 1787; Dare, S. A., Barnes, S. J., Prichard, H. M., & Fisher, P. C. (2014). Mineralogy and Geochemistry of Cu-Rich Ores from the McCreedy East Ni-Cu-PGE Deposit (Sudbury, Canada): Implications for the Behavior of Platinum Group and Chalcophile Elements at the End of Crystallization of a Sulfide Liquid. Economic Geology, 109(2), 343-366.; Kjarsgaard, I. M., & Ames, D. E. (2010, June). Ore mineralogy of Cu-Ni-PGE deposits in the North Range footwall environment, Sudbury, Canada. In 11th international platinum symposium, program abstracts, Ontario Geological Survey, miscellaneous release-data (Vol. 269). Ames, D.E., Kjarsgaard, I.M., and Douma, S.L., 2003, Sudbury Ni-Cu-PGE Ore Mineralogy Compilation: Sudbury Targeted Geoscience Initiative (TGI): Geological Survey of Canada, Open File 1787; Kjarsgaard, I. M., & Ames, D. E. (2010, June). Ore mineralogy of Cu-Ni-PGE deposits in the North Range footwall environment, Sudbury, Canada. In 11th international platinum symposium, program abstracts, Ontario Geological Survey, miscellaneous release-data (Vol. 269). Econ Geol (1988) 83:492-510; Econ Geol (1986) 81:1272-1277; Hulbert, L. J., Duke, J. M., Eckstrand, O. R., Lydon, J. W., Scoates, R. F. J., Cabri, L. J., & Irvine, T. N. (1998) Geological Environments of Platinum Group elements. Geological Survey of Canada, Open File 1440. Natural Resources Canada. Canadian Mineralogist (1973): 11: 903-912. Mulja, T. & Mitchell, R.H. (1990) Platinum-group minerals and tellurides from the Geordi Lake intrusion, Coldwell complex, Northwestern Ontario. Canadian Mineralogist 28, 489-501. 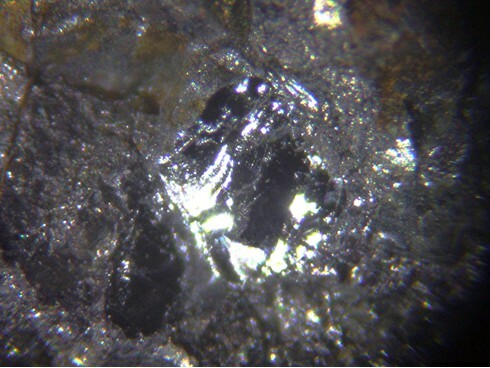 COOK, N.J. & WOOD, S.A. (1994) Platinum-group minerals in the Lac Sheen Cu-Ni-PGE prospect, Quebec. Canadian Mineralogist, 32,703-712. Zhu, W. G., Zhong, H., Hu, R. Z., Liu, B. G., He, D. F., Song, X. Y., & Deng, H. L. (2010). Platinum-group minerals and tellurides from the PGE-bearing Xinjie layered intrusion in the Emeishan Large Igneous Province, SW China. Mineralogy and Petrology, 98(1-4), 167-180. Chunming Han, Wenjiao Xiao, Guochun Zhao, Wenjun Qu, and Andao Du (2007): Ore Geology Reviews 32, 452-468. Haluzova, E., Ackerman, L., Pasava, J., Jonasova, S., Svojtka, M., Hrstka, T., & Veselovsky, F. (2015). Geochronology and characteristics of Ni-Cu-(PGE) mineralization at Rozany, Lusatian Granitoid Complex, Czech Republic. Journal of GEOsciences, 60(4), 219-236. Vavřín, I.: Přehled mineralogie, geochemie a ložisek platinových kovů. Bulletin mineralogicko-petrografického oddělení Národního muzea v Praze, 1997, roč. 4-5, s. 132-140.; Pašava, J., Vavřín, I., Frýda, J., Janoušek, V., & Jelínek, E. (2003). Geochemistry and mineralogy of Platinum-group elements in the Ransko gabbro–peridotite massif, Bohemian Massif (Czech Republic). Mineralium Deposita, 38(3), 298-311. Helmy, H.M., and Mogessie, A. (2001): Mineralium Deposita 36, 58-71. Helmy, H. M. (2005). Melonite group minerals and other tellurides from three Cu–Ni–PGE prospects, Eastern Desert, Egypt. Ore Geology Reviews, 26(3-4), 305-324. Papunen, H., 1985,The Kylmäkoski Nickel-Copper deposit. 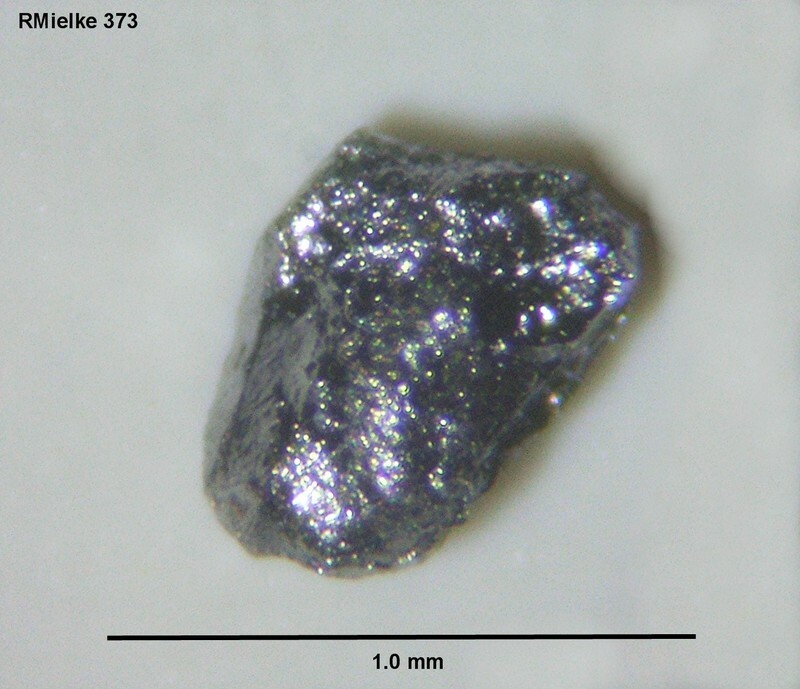 Geological Survey of Finland bulletin 333. Devaraju, T. C., & Alapieti, T. T. (2014, January). Exploration for PGE mineralization in the Western Dharwar Craton. In Proceedings of the Workshop on Magmatic Ore Deposits. Geol. Soc. India Special Publ (Vol. 2, pp. 43-60). T. T. Alapieti, T. C. Devaraju, R. J. Kaukonen (2005) Sem-eds Study of the Platinum-group Minerals in the PGE mineralized Hanumalapura Segment of the Layeredmafic-ultramafic Complex of Channagiri, Davangere District, Karnataka. Jour. Geol. Soc. India, 65:745-752. Gouedji, F., Picard, C., Coulibaly, Y., Audet, M. A., Auge, T., Goncalves, P., ... & Ouattara, N. (2014). The Samapleu mafic-ultramafic intrusion and its Ni-Cu-PGE mineralization: an Eburnean (2.09 Ga) feeder dyke to the Yacouba layered complex (Man Archean craton, western Ivory Coast). Bulletin de la Société Géologique de France, 185(6), 393-411. Prokopyev, I.R., Izokh, A.E., Borisenko, A.S., Naumov, E.A., and Seltmann, R. (2010): Presented at the 11th International Platinum Symposium, June 21-24, 2010. Shvedov, G. I., & Barkov, A. Y. (2017). Primary and alteration assemblages of platinum-group minerals from the Ognit complex, Irkutskaya oblast, Eastern Sayans, Russia. Neues Jahrbuch für Mineralogie-Abhandlungen: Journal of Mineralogy and Geochemistry, 194(1), 35-48. Abzalov, M.Z., and Both, R.A. (1997): Mineralogy and Petrology 61, 119-143. Can Min (2002) 40, (2), 679-692; Mineralogical Magazine 1996 60 : 973-978. Holwell, D. A., McDonald, I., & Armitage, P. E. B. (2006). Platinum-group mineral assemblages in the Platreef at the Sandsloot Mine, northern Bushveld Complex, South Africa. Mineralogical Magazine, 70(1), 83-101.; Armitage, P. E. B., McDonald, I., Edwards, S. J., & Manby, G. M. (2002). Platinum-group element mineralization in the Platreef and calc-silicate footwall at Sandsloot, Potgietersrus District, South Africa. Applied Earth Science: Transactions of the Institutions of Mining and Metallurgy: Section B, 111(1), 36-45.; HOLWELL D.A., MCDONALD I. & ARMITAGE, P.E.B. (2006). Platinum-group mineral assemblages in the Platreef at the South Central Pit, Sandsloot Mine, northern Bushveld Complex, South Africa. Mineralogical Magazine, 70, 83-101. Fanus Viljoen, F., Ramakoloi, N., Rose, D. and Reinke, C. (2016) Mineral Chemistry of (Pt,Pd)-Bismuthotelluride Minerals In the Platreef At Zwartfontein, Akanani Project, Northern Bushveld Complex, South Africa. The Canadian Mineralogist, 53(6), 1109-1127. Dzvinamurungu, T. (2012). Geometallurgical characterisation of Merensky Reef and UG2 at the Lonmin Marikana mine, Bushveld Complex, South Africa (Doctoral dissertation, University of Johannesburg). Smith, A. J. B., Viljoen, K. S., Schouwstra, R., Roberts, J., Schalkwyk, C., & Gutzmer, J. (2013). Geological variations in the Merensky Reef at Bafokeng Rasimone Platinum Mine and its influence on flotation performance. Minerals Engineering, 52, 155-168. Suárez, S. et al. (2010): Mineralium Deposita 45, 331-350. ; R. Piña, F. Gervilla, L. Ortega, R. Lunar (2008): Mineralogy and geochemistry of platinum-group elements in the Aguablanca Ni-Cu deposit (SW Spain). Mineralogy and Petrology 92, 259-282.
ⓘ Rum Central Complex ? Power, M.R., Pirrie, D., Andersen, J.C.O., and Butcher, A.R. (2000): Mineralium Deposita 35, 762-775. Brent Thorne specimen analyzed by Sid Williams. Label says Bunkerville District but the actual locality is probably the Key West mine. Economic Geology (1990) 85:556-584; Allan H. Wilson and Martin D. Prendergast (2001) Platinum-Group Element Mineralisation in the Great Dyke, Zimbabwe, and its Relationship to Magma Evolution and Magma Chamber Structure. South African Journal of Geology, 104:319-342; LIU, J., JIN, S. and WANG, Y. (2014), The Occurrence of Useful Components in Platinum-Palladium Deposit in the Great Dyke, Zimbabwe. Acta Geologica Sinica, 88: 1466–1467; Oberthür, T., Weiser, T. W., Gast, L., & Kojonen, K. (2003). 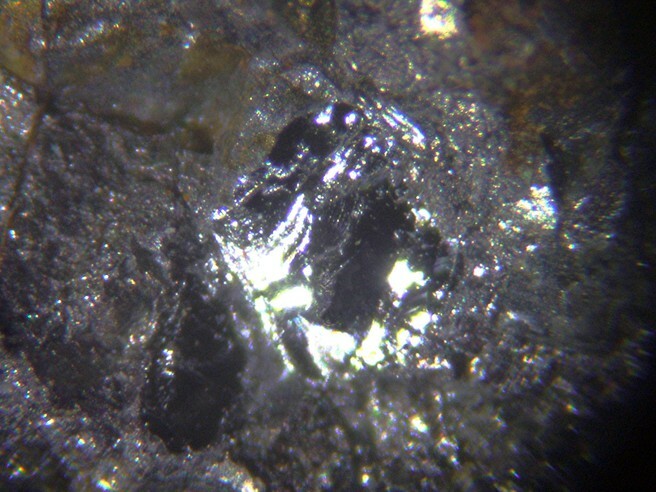 Geochemistry and mineralogy of platinum-group elements at Hartley Platinum Mine, Zimbabwe. Mineralium Deposita, 38(3), 327-343.